In this fun and easy to follow DVD, you will learn how to add positive reinforcement into your current training program both (on the ground and under saddle). 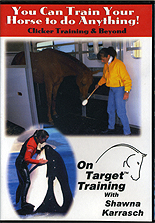 This DVD has helped 1000's horses and their humans to improve their relationship AND they both enjoy the process! It will help you to understand why your horse does the things he does. Furthermore, you will learn how to change and shape his behavior. You will learn how to establish the clicker as a communication tool, as well as how and when to use the target. This training is ideal for every discipline and level of rider. You will be thrilled with the change in your horse. The DVD was filmed at Olympic Gold Medalist (Show Jumping) Beezie Madden and her husband, John's farm in Cazenovia, NY. Beezie discusses how she uses On Target Training under saddle.